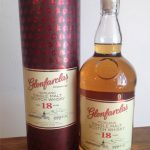 Glenfarclas 18, Original Bottling, 43% vol. 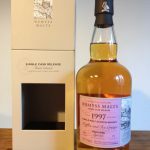 Clynelish, Wemyss Malts, 54.2% vol. On the nose I get vanilla, floral notes and some yeast. As weird as it sounds I do get something creamy. Could be the ice cream they are talking about. Peaches, Apricots and minimal oak. Also pencil shavings and old school shoe polish. There is a savoury note in there and just a whisp of smoke. It tastes sweet and round with a wonderful creamy mouth feel. I don’t find any waffles but maybe it should rather be “Peaches and Cream”. With water it gets fresher, more lemons but the general profile remains. Lots of tinned fruit and and cream. Looses some depth but it’s worth playing with water. 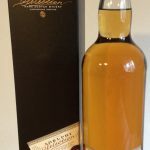 The finish is long with good lingering oak. Quality liquid from Wemyss. Bunnahabhain 11, Adelphi Selection, 56.4% vol.